Laura is Marketing Manager at Akvo and founder of The Marketing Palette, a marketing consultancy agency for non-profit organisations. Previously, she worked as Global Marketing and Communications Adviser with SNV and as Senior Marketeer with the European Association for International Education. She also volunteered as marketing adviser for various charities in the Netherlands. Laura’s studies took her to the Netherlands, Romania, Poland and Germany. 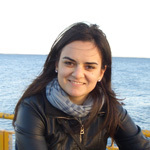 Originally from Romania, Laura has an MSc in Strategic Marketing from the University of Maastricht (for which she received the Huygens Scholarship in 2009). She has a Bachelor’s degree in Business Administration complemented by a second one in International Marketing from the Academy of Economic Studies in Bucharest. She also followed courses at Lazarski University in Warsaw and Heidelberg University in Germany. During her master’s in Maastricht she realised she wanted to use her marketing knowledge to improve non-profit organisations in Europe. Laura is full of energy and enthusiasm, likes to challenge the status quo and always looks for ways to improve herself and the environment she works in. As Marketing Strategist for HUTAC, she hopes to contribute to strengthening the HUTAC community, boost its visibility and strategically move the association forward. In her free time she loves travelling, exploring new cultures, meeting new people and reading books/watching documentaries on social and political issues. She also plays board games with friends, loves skiing and skating and has a great passion for penguins, taking every opportunity to learn more about them and their community spirit.